Eric first became interested in wine in 1983, after sampling some of the 1982 Bordeaux vintage. Once bitten, he spent the next several years attending as many tastings and wine seminars as possible. Since 1990, Eric has visited over 600 wineries in the U.S. and Europe. His interactions with winemakers and/or proprietors has further enriched his life as well as his interest in wine. Eric is also part of GrapeRadio, the James Beard award-winning podcast team. After taking a few wine courses through UC Extension in the early '90s, Bay Area architect Ken Zinns developed a serious interest wine. Ken has been touring and tasting wines for nearly 20 years, and has come to love not only the wines, but also the people behind them. Ken's interest in wine is more than passive - he works at several urban East Bay wineries since 2001, and is the assistant winemaker for both Eno Wines in Berkeley and Harrington Wine in San Francisco. At the beginning of the year, Ken Zinns began to think about making a trek to some West Sonoma Coast wineries and vineyards, and he wondered if I'd be interested in coming along. He had some definite visits in mind - and, who knows, maybe we'd even include some of the folks we'd visited on our first time through the gorgeous Sonoma Coast region. A Sonoma Coast trip sounded good to me as well, especially considering there had been a recent growth in winery efforts to create "balanced wines" - those wines with sufficient acid to balance out the fruit, coupled with lower alcohol levels. Considering the cooler climate of the Sonoma Coast, this had become 'ground zero' for many of these efforts. (The Anderson Valley is another frequently cited cool-climate region that has become part of this effort.) 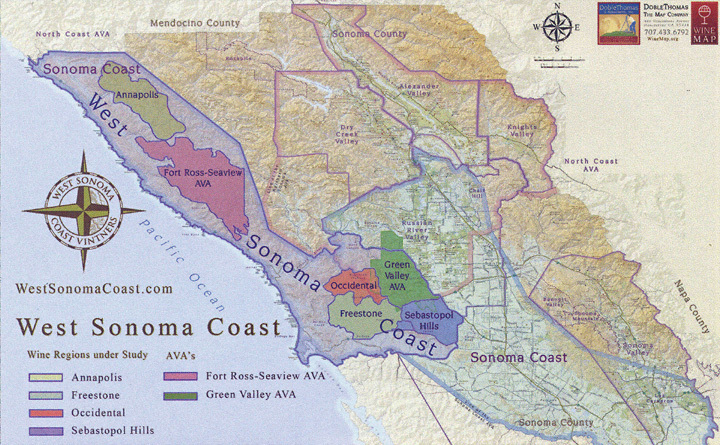 In addition, the Sonoma Coast AVA was never a "one size fits all" type of appellation. Not surprisingly, several of the micro-climates within the AVA were beginning to pursue their own sub-appellations - smaller regions that would be more reflective of their specific typicity, and something definitely not common to everyone in the "Sonoma Coast" appellation. By February, Ken had roughed out an itinerary, with plans to head out in late May. Well, with one thing and another gumming up the plans (me included), we needed to postpone the trip until late June. It was just as well, we both thought. June would give us fabulous weather for checking out vineyards and such. Well, what's that they say about the best laid plans? It turned out to be unseasonably drizzly and rainy during each day of the trip. "This almost never happens," was the constant refrain we heard at each stop - and these were people who should know. But, over the years we've become semi-pro at this, so, we persevered. Once again, we put the word out to all the Bay Area grape-nutz, including, Alan Rath, Eric Lundblad, Al Osterheld, and Paul Homchick. We were all hands on board, except for Al, who had some pressing issues with work. My old pal Michael Poston was also along for the ride - in fact, he was the driver, something he may have regretted as soon as his car left the pavement! Our intention was to spend a few of days making 6-7 visits to wineries and/or vineyards that seemed to typify what was taking place in the West Sonoma Coast. Ken and I split up the task of contacting several wineries, winemakers and growers to start setting things up. While we we're able to coordinate timing with everybody we wanted to visit with, we did get most of them. One note: consistent with splitting up our contacting of wineries, Ken and I decided to also split up the responsibility for documenting the visits. So, you see, what you really have here is a two-fer! As Eric mentioned, I’d been interested in making a visit to the western Sonoma Coast for awhile. My interest was intensified in summer of 2012 when I attended the second annual West of West event, held by the West Sonoma Coast Vintners organization, and was greatly impressed by the wines I tasted there. The group is looking to create an identity for the West Sonoma Coast that is distinct from that of the overall Sonoma Coast AVA. 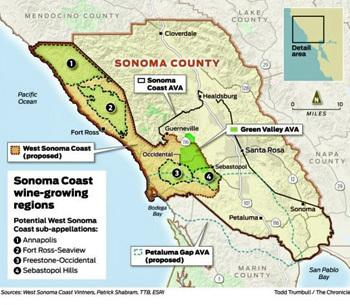 And just as these vintners are seeking to differentiate themselves from those in the other parts of the huge Sonoma Coast appellation, there is a move to identify distinct sub-regions of the West Sonoma Coast. So this trip started out as an exploration of the West Sonoma Coast and its sub-regions. I wish we’d had more time to visit in the area, but as usual, we all had limited time available in our busy schedules so we tried to boil things down to a three-day itinerary. There were many other wineries and vineyards I would have liked to include in this report, but we did what we could in the time we had! We've included an interactive map (below) to navigate to the additional information about each of the various sub-regions within the West Sonoma Coast. It’s often been noted that the Sonoma Coast AVA is far too large and varied to be of much use in defining the region and its wines. It’s a very large appellation – over 515,000 acres or 800 square miles, with about 5% of that area planted to winegrapes. By comparison, the Russian River Valley – a good-sized appellation in its own right – has less than 170,000 acres. Established in 1987, the Sonoma Coast AVA boundaries are said to have been proposed by Brice Jones (founder and then-owner of Sonoma Cutrer and now owner of Emeritus Vineyards) in order to allow his winery to include its many vineyard sources within a single appellation. The AVA stretches from the Mendocino border and Pacific Ocean in the north and west all the way to San Pablo Bay and the southwest reaches of Napa Valley in the south and east. Over 35 grape varieties are grown commercially in the Sonoma Coast, though production is dominated by Chardonnay and Pinot Noir. Syrah, Zinfandel, and Sauvignon Blanc are the next most-planted varieties, though far behind the two Burgundian grapes. You want a confusing AVA? Sonoma Coast fits the bill there. It overlaps most of the Russian River Valley AVA (including the entire Green Valley of Russian River Valley AVA), as well as parts of the Chalk Hill, Carneros, Bennett Valley, and Sonoma Valley AVAs. This is a very diverse and complex appellation, part of why many people would like to see it divided into more sub-regions. Only Green Valley of Russian River Valley (we’ll call it Green Valley here for short) and Fort Ross/Seaview – just approved in 2011 – are currently separate AVAs within the larger Sonoma Coast appellation. The Petaluma Gap has often been discussed as a logical choice for a separate AVA but this still seems a long way off. This area is defined by exposure to fog and especially to the cool wind blowing in from the coast near Bodega Bay and through most of the region. The wind does have an effect on the Petaluma Gap’s grapes and wines – in general, the wines tend to be bigger than those from most of the western Sonoma Coast though they retain very good acidity. With an AVA as large and diverse as the Sonoma Coast, I suppose it’s no surprise that there is no single vintners association that speaks for the entire appellation. Other than the Russian River Valley Winegrowers, there seem to be only two official organizations that currently represent portions of the overall AVA – the Petaluma Gap Winegrowers Alliance (formerly Petaluma Gap Wine & Grape Alliance) was established in 2006 and the West Sonoma Coast Vintners was founded in 2010. The West Sonoma Coast Vintners group seeks to differentiate a specific portion of the overall AVA – the entire western part that runs along the coast and extending inland south of the Russian River roughly to Highway 116 from Sebastopol and Graton to Forestville. This leaves out most of the Russian River Valley as well as the eastern part of the Petaluma Gap and the entire southeastern part of the current Sonoma Coast AVA. This West Sonoma Coast region corresponds roughly to what many in Sonoma County would consider the “West County,” away from the more populous areas along Highway 101 from Petaluma through Santa Rosa and Healdsburg. Sebastopol is the largest town in this area, with a population of around 7,400. Most towns in the main winegrowing part of the West County are much smaller, with Forestville being the only other one with a population exceeding 2,000. Others are smaller still – Occidental at about 1,100, Annapolis at 400, and Freestone at only 50. Sebastopol is widely considered the “capital” of the West County area, while quaint Occidental, with its famed family-style Italian restaurants, has long been a draw for those looking for a weekend getaway from busy city life. Before growing winegrapes took hold, part of the West Sonoma Coast was pasture for sheep and cattle, part was dense forest that was logged over the years, while the southeastern part was best-known for producing apples – hence the common name for Highway 116 as the “Gravenstein Highway.” Though apple orchards still remain there, many have been converted to vineyards, and a number of buildings originally used for the apple industry have been re-purposed as wineries as well. Even though the West Sonoma Coast is a better-defined wine region than the current Sonoma Coast AVA, there are still a number of widely-recognized sub-regions: Annapolis, Fort Ross/Seaview, Occidental, Freestone, Green Valley, and the Sebastopol Hills. As already noted, Fort Ross/Seaview and Green Valley have already been established as separate AVAs, and while the other areas could potentially apply for AVA status in the future, there do not seem to be any immediate plans to do so. During our brief three-day tour of the West Sonoma Coast, we visited vineyards in a number of these sub-regions and tasted wines sourced from all of them. The West Sonoma Coast region’s earliest inhabitants were mostly from the Pomo and Coast Miwok peoples, and both Spanish and English explorers visited the region as early as the 16th Century. But it was the first permanent European settlement in the area that also brought its first viticulture – the Russian outpost at Fort Ross, located along the rugged coastline north of the Russian River. Captain Leontii Andreianovich Hagemeister is recorded as having brought grape cuttings from Peru in 1817 and planting them somewhere in the area. Neither the exact location of the vineyard nor the variety of grapes planted there is known. After the Russians left Fort Ross in 1841, it was a few decades before other immigrants, many of them from Italy, began planting winegrapes in the area – this time mainly in Russian River Valley. Some of these vineyards were located in the western part of that area, known as Green Valley, and a few remain to this day – Martinelli’s Jackass Hill Vineyard is a famed example. It was not until the 1970s that commercial vineyards were planted in the farther reaches of the Sonoma Coast, and it has only been within the past 20 years or so that viticulture has really taken hold in the area. For years, it was thought by many that this area was too cold to ripen winegrapes on a consistent basis, but little by little, vineyards have spread throughout the region and proven that view to be wrong. Different sub-regions of the Sonoma Coast AVA have different climatic conditions, and if we exclude the warmer parts in the eastern Russian River Valley (Chalk Hill area), nearly all of the appellation can be considered cool climate. While we didn’t explore the Petaluma Gap region on this trip, a good deal of it is quite cool – a number of vineyard sites in its western portion are cooler than parts of the West Sonoma Coast, though the eastern part is warmer. The West Sonoma Coast tends to get more winter and spring precipitation than other parts of Sonoma County – in some cases far more. The Sonoma Coast north of the Russian River includes one of the rainiest spots in California – Cazadero – and rainfall has been known to exceed 100 inches in some years. Although you might think that the vineyards located closest to the coast in the West Sonoma Coast would be the coolest ones, that is often not the case. The reasons for this are elevation, fog, and wind. Many of the vineyards closest to the coast are perched on ridgetops above the fog line – without this advantage of higher elevation, the grapes would not be able to ripen in these particular locations. So these spots – mostly within the Fort Ross/Seaview sub-region but also found in Annapolis and Occidental – can be thought of as warmer islands within very cool areas. 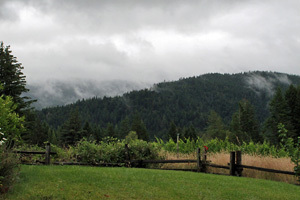 Lower elevation vineyard sites throughout the West Sonoma Coast area are generally more exposed to fog and can be cooler than the higher sites, even though many are somewhat farther inland – Freestone and parts of Annapolis and the Sebastopol Hills are good examples of this. These vineyards usually need to be sheltered from the cold fog and wind or the grapes there would be unlikely to ripen. Even at the warmest sites, average daytime high temperatures during the summer are moderate, most no warmer than the low 80s. The coolest sites average summer highs only in the mid-70s. By comparison, most vineyards located in the "Middle Reach" of Russian River Valley – home to many of that region's most highly-regarded sites – reach average summer highs in the low- to mid-80s. Lower-elevation vineyards in the West Sonoma Coast in particular cool down considerably at night, thanks to the fog. In such marginal growing sites, there is greater importance placed on the orientation of vineyard slopes, with south- and west-facing slopes generally being warmer and giving the grapes a better opportunity to ripen. Still, many sites with east- or north-facing slopes can produce exceptional fruit with the right farming and some good fortune from Mother Nature. This is almost entirely a hilly region, becoming rugged and mountainous in some areas. For this reason, vineyard sites are generally small in comparison to those in other, more gently-sloped parts of the Sonoma Coast AVA. As in other parts of coastal California, the San Andreas Fault plays a part in the geology – it runs along the main fork of the Gualala River through the northern part of the appellation. It’s a geologically diverse region, with the movement of tectonic plates and related volcanic activity creating the typical mish-mash of soils and rocks found throughout much of California’s coastal areas. 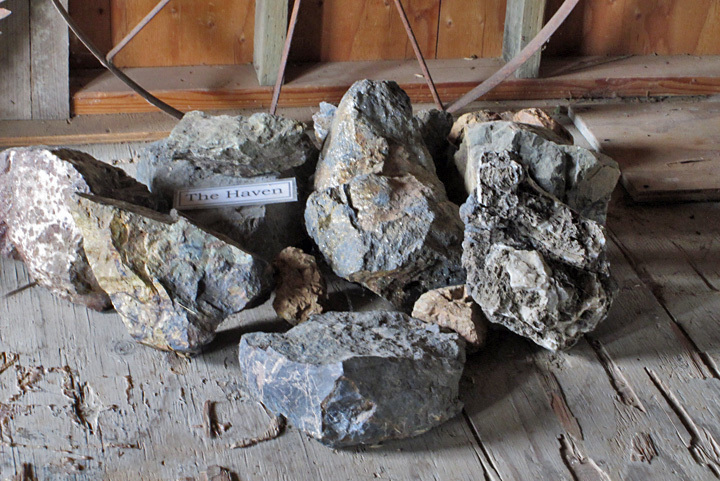 It’s not uncommon to find many soil conditions just within individual vineyard sites. Formed from marine sandstone, the famed sandy loam Goldridge soil of Russian River Valley is also found in many parts of the West Sonoma Coast, even as far as in its northern reaches in the Annapolis area. Most soils throughout the region are well-drained, lending themselves well to vineyard plantings. As the first AVA within the West Sonoma Coast that’s not also part of another appellation (as with Green Valley), the Fort Ross/Seaview appellation has gotten a lot of attention since its approval in late 2011. This is the area many think of as the “true” Sonoma Coast, a more remote and mountainous region than either the Annapolis area farther north or the areas south of the Russian River. The widely-scattered vineyards are generally accessed by narrow, steep and twisting roads, often unpaved. Vineyards that may be only a mile or two from each other as the crow flies may be a half-hour apart by road. With the only hope of ripening grapes being to plant above the fog line, most vineyards are located at higher elevations of around 1,200 to 1,700 feet along the coastal ridgetops. The elevation also leads to a lower diurnal temperature swing. Mick Bohan established the first modern grape plantings in the area in the early 1970s, and Sea Ridge Winery produced some noted wines from Bohan fruit in the early 1980s. But the region's breakthrough came when fruit from Hirsch Vineyard, initially planted by David Hirsch in 1980, began to be featured in highly-rated Pinot Noirs from Littorai, Williams Selyem, and others. 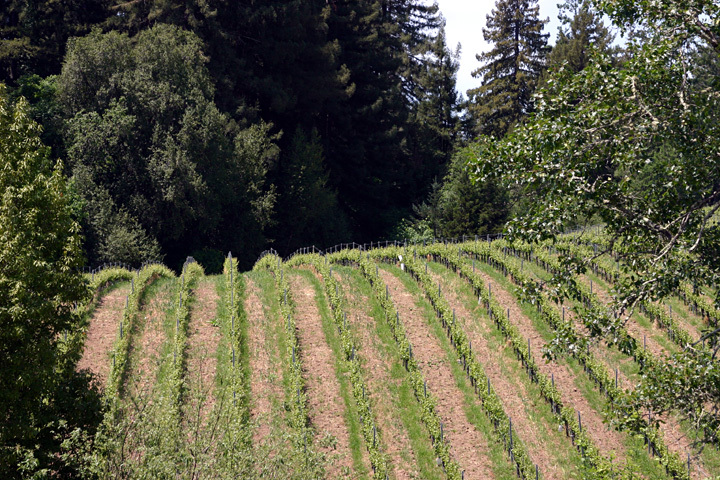 Other early plantings in the area included Precious Mountain Vineyard, first planted in the mid-1970s, and Wild Hog Vineyard and Martinelli’s Charles Ranch in the early 1980s. 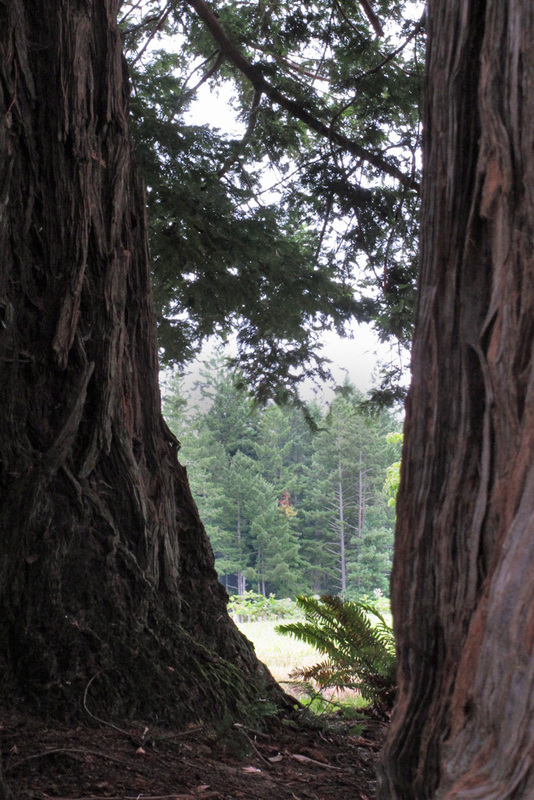 By the end of the 1980s, the region was “discovered,” and plantings by Flowers, Fort Ross, Marcassin, Pahlmeyer, Peter Michael, Red Car, Failla, and others have followed over the years. The northernmost sub-region of the West Sonoma Coast, Annapolis shares the Gualala River watershed with the Fort Ross/Seaview area just to the south. Like that area, it features lots of forested land, though the mountains tend to be less steep and rugged. Vineyards are set at lower elevations – mostly between 650 and 1,000 feet – than those of their southern neighbors. The lower elevations lead to cooler daytime temperatures and more fog during the growing season. Annapolis Winery probably is responsible for earliest modern commercial winegrape plantings in the area, first established in 1978 just outside the town of the same name. But it was not until Peay Vineyard was planted in the late 1990s and their estate wines gained notice that the region was looked at as a source of high-quality grapes. Hartford Court’s Far Coast Vineyard and Campbell Ranch are other well-known sites in the area, and there have been significant new plantings in recent years by Thomas Rivers Brown, Emeritus, and others. The Occidental area rivals Fort Ross/Seaview as the home to the most highly-regarded vineyards in the West Sonoma Coast. Most vineyards are located well west of the town of Occidental, with many clustered along Taylor Lane and Fitzpatrick Lane. Not as mountainous as the regions north of the Russian River, the area features forest along with coastal grasslands, and vineyards are typically sited on hillsides and ridgetops at elevations of around 800 to 1,200 feet, with many of them above the fog line. Although it’s a bit farther inland than Fort Ross/Seaview or Annapolis, cool marine air is carried through gaps in the coastal mountains and some east-west ridges. 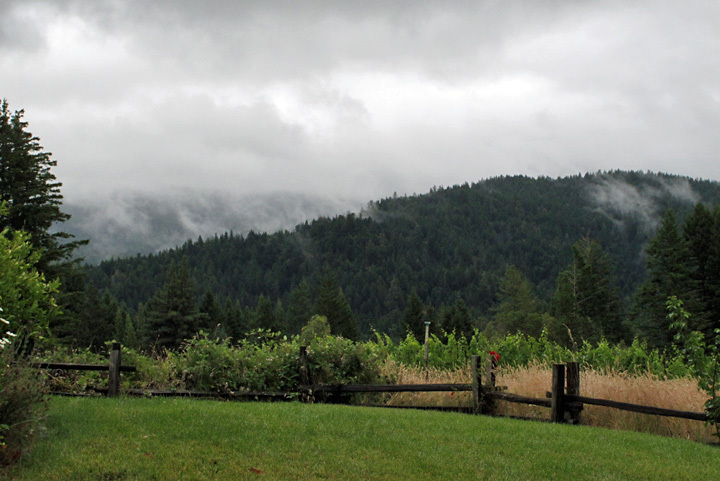 Summa was the first modern vineyard in the Occidental area to gain acclaim – planted in the late 1970s, Summa Pinot Noirs from Williams Selyem became benchmarks for the area. Other noted vineyards followed, including Thieriot, Coastlands, Que Syrah, Taylor Ridge, Littorai’s The Haven, Hartford Court’s Seascape, and many others. One of the two southernmost sub-regions of West Sonoma Coast, the Freestone area is located near the northern edge of the Petaluma Gap, and shares its cold, foggy, and windy character. With lower, rolling hills and less forestland than its Occidental neighbor to the north, the landscape has a more coastal appearance. Vineyards are mostly located a short distance to the north and west of the tiny town of Freestone, at elevations of 300 to 700 feet. Much of the area is quite cool during the growing season, so vineyards are planted in sites that are more sheltered from the wind and fog. Freestone was considered too cold to ripen winegrapes for many years, but the Dutton Ranch Freestone Hill Vineyard, planted mid-1990s, showed that it could be done. Joseph Phelps followed in 2000 with its significant vineyard plantings not far away. Other noted vineyards planted in the area include Platt, Kistler, Marimar Estate’s Doña Margarita Vineyard, and Zephyr Farms. Located east of Freestone, the Sebastopol Hills extend to the west and south of the town of Sebastopol. While a somewhat hilly area, it’s a more open landscape than found in most other sub-regions of the West Sonoma Coast. It has a similar climate to that of Freestone, with fog being a key feature. Vineyards are at lower elevations, mostly from around 200 to 500 feet. With more open terrain, and some sites that had once been apple orchards, there are more sizable vineyards in the area along with many smaller ones. There have been vineyards in the Sebastopol Hills area for many years, but it’s experienced a major growth over the past 20 years. Noted vineyards in the area include Pratt, Littorai’s The Pivot, Klopp Ranch, Rice Spivak, Halleck, Emeritus, Peters, Meredith Estate, Kanzler, Ramondo, Suacci, DuNah, and many others. Green Valley sports its rather awkward appellation name due to another Green Valley AVA in California, in Solano County. It has had its own AVA since 1983. Like the Sebastopol Hills just to the south, it’s a moderately hilly area, though unlike its neighbor, it features a good deal of forested land in its western part. Vineyard elevations range from about 200 to 800 feet. Mountains to the west afford the area more protection from fog and wind than in the Sebastopol Hills, so it tends to be slightly warmer, even though it’s the coolest portion of Russian River Valley as a whole. We’ve already noted that some very old vineyards such as Jackass Hill remain in the area from before Prohibition, but the modern era of viticulture in Green Valley was spurred in large part though the plantings of Warren Dutton beginning in the late 1960s. The Dutton family continues to be one of the largest growers in the area. Green Valley has many highly-regarded vineyards, and Keefer Ranch, Charles Heintz, Iron Horse, Rued, Freeman, Graham Family, and Marimar’s Don Miguel are a just few examples.